India's mammoth parliamentary election will start on April 7, authorities announced on Wednesday, kicking off a race that will pit charismatic Hindu nationalist leader Narendra Modi against the ruling Congress party. 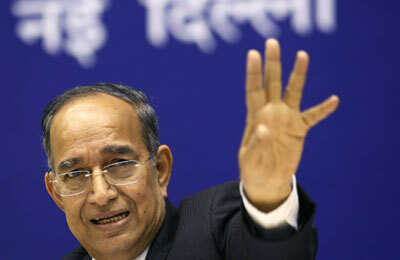 Chief Election Commissioner V S Sampath said 814 million people will be eligible to vote, a number larger than the population of Europe, making this the biggest election the world has ever seen. Results are due to be announced on May 16. Voting will be held in nine stages, staggered until May 12 to allow security forces to focus their strength during an exercise that, for decades after independence from Britain in 1947, has often been marred by violence and ballot-rigging. Running on his strong economic track record as chief minister of the state of Gujarat, Modi has emerged in opinion polls as the favourite, reflecting popular anger over corruption and a sense that the centre-left Congress government frittered away opportunities for rapid growth after coming to power in 2004. Exuding self-confidence, Modi has won the support of many middle-class Indians who even a year ago would not have voted for a man accused by critics of failing to stop, or even tacitly encouraging, a spasm of Hindu-Muslim bloodshed in Gujarat in 2002. Modi has denied any wrongdoing and the Supreme Court has said there is not enough evidence to pursue investigations. With half of India's population under 25, a record number of first-time voters is expected to participate in the election and many appear open to Modi's promises of job creation and efficient government. "I think everyone is looking for strong leadership. This places Modi at an advantage. He's showing that he's a strong leader," said Mohan Guruswamy of the Centre for Policy Alternatives, a Delhi-based think-tank. However, India's fragmented political landscape and first-past-the-post system for parliamentary seats makes results notoriously hard to predict, and that means a victory is by no means assured for Modi's Bharatiya Janata Party (BJP). Recent polls show the BJP well short of a majority of the 543 lower house of parliament seats at stake, but widening its lead over the ruling Congress party, which has ruled for more than two-thirds of the 67 years since independence but may now be headed for its worst-ever electoral defeat. Last week, a small regional party joined the BJP-led alliance, following several splinter groups that rejoined, a possible sign of Modi's growing acceptability. A multi-headed group of regional parties is also eyeing power, however, a reflection of the growing clout of state-based leaders. A 'third front' government made up of regional groups with diverse agendas could prove unwieldy, a potential problem for Asia's third-largest economy, whose growth has skidded due to the slow pace of reform on the Congress party's watch. Leading the campaign for the Congress party is Rahul Gandhi, the latest in line in the Nehru-Gandhi dynasty that has given India three prime ministers and its most powerful contemporary politician, his mother, Sonia Gandhi. This time, after two consecutive Congress-led governments headed by Prime Minister Manmohan Singh, India seems unlikely to make another Gandhi prime minister. Adding to the uncertainty, a new anti-corruption party has emerged as a serious player. The Aam Aadmi (Common Man) Party is not likely to win many seats, but is setting the agenda for other parties by harping on high utility prices and crony capitalism. The election comes as the economy is on course to grow at below five percent for the second year running, which would be the worst performance since the 1980s for a country that a few years ago was confident of matching China's run of double-digit expansion. Modi has the backing of big business, which wants him to replicate his Gujarat state model of good roads, 24/7 electricity and less red tape. Last week, he promised to simplify laws if elected, and to put trade at the heart of foreign policy. As the election drumbeats get louder, overseas investors have extended a buying streak of Indian shares, totalling $800 million in a run of 13 sessions until Tuesday. Businesses have put investment plans on hold ahead of the elections, leading to a contraction in capital formation and worsening a slowdown that could, however, be reversed after results are declared in May.